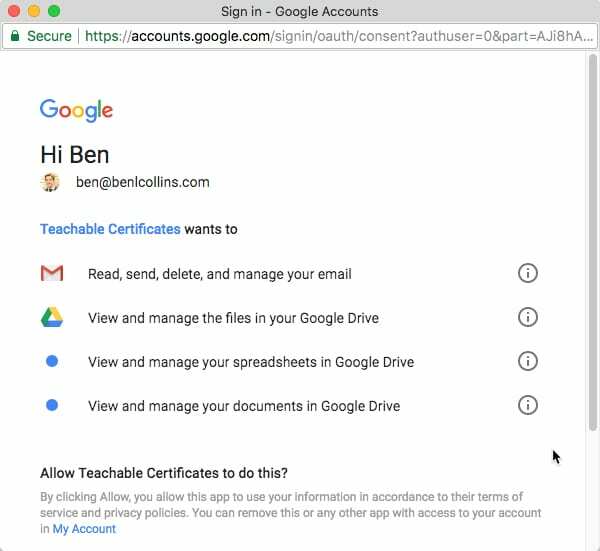 In this post I’m going to show you how you can setup a system to automatically issue certificates to students who complete an online course on the Teachable platform, using Google Apps. First, it captures course completion data in a Google Sheet. 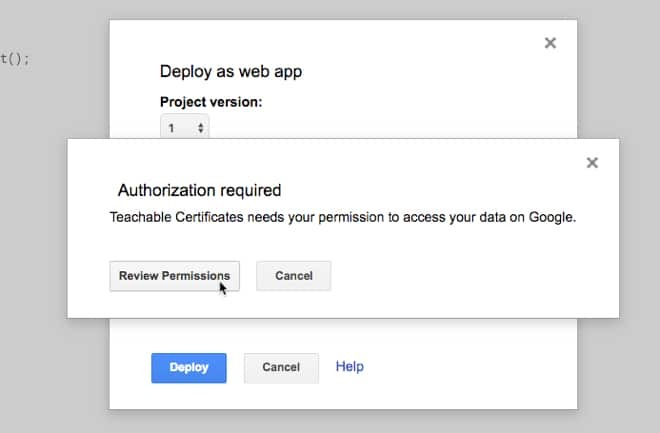 Second, it creates a PDF certificate based on a Google Doc template. And third, it emails that certificate out to the student via Gmail. It has the advantage that it’s free and doesn’t involve any other paid third-party tools. It has the disadvantage that there’s quite a few steps involved to get it all hooked up. Before trying to connect to Teachable, it’s a good idea to understand what’s happening with a quick example. Here we’ll add some Apps Script to our Google Sheet and demonstrate how data can be piped into our Google Sheet from an external website. 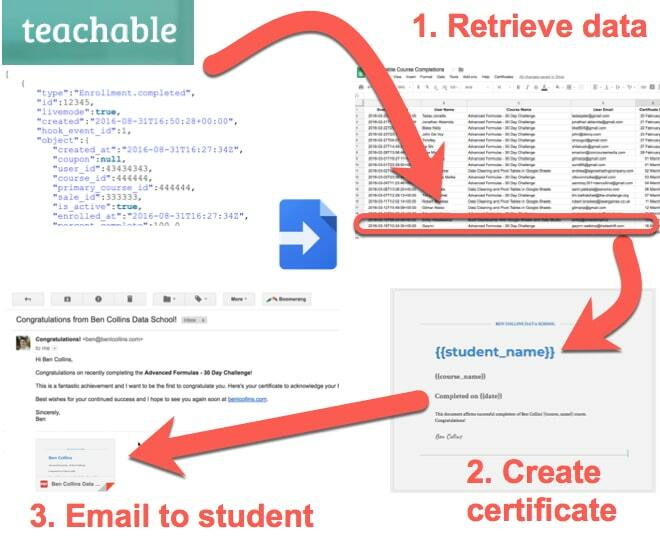 Save and give your project file a name, like Teachable Certificates. If you don’t see this screen, then don’t panic! 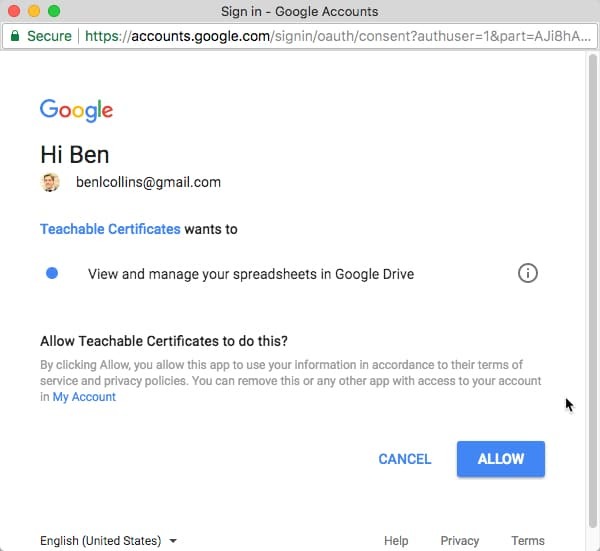 You have an extra step and need to click the small Advanced button at the bottom left first, and then on “Go to Teachable Certificates (unsafe)”. This is additional security layer from Google because this app hasn’t been verified by Google. Keep a copy of this as we’ll need it shortly for testing and we’ll use it again for the Teachable setup. 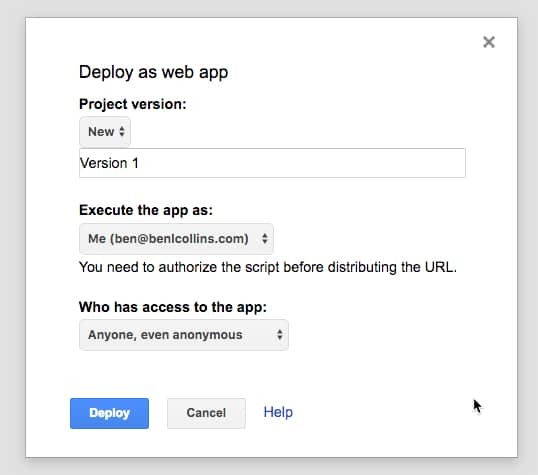 Important Note: Anytime you make a change to your code you’ll need to re-publish the web app, following these steps, for the changes to take effect. The “Current web app URL” doesn’t change however, so all you need to do is click Update. It’s the same URL for the updated code. Update August 2018: Unfortunately, the hurl.it service that I used when writing this article is no longer available. You’ll have to use an alternative like Postman. Open the website hurl.it, which we’ll use to simulate a Teachable post request. So that’s a very basic example to show how data can be received from a different website and displayed in our Google Sheet. which is the parameter we entered on the hurl.it site. We collect the data from Teachable in exactly the same way as the example above, only Teachable sends it automatically anytime a course completion event is triggered. The script is only marginally more complex, to parse the data packet and only grab the fields we want. Separately, we create a Google Doc template for our certificate. When a new course completes, the data arrives in our Google Sheet with the student name, date and course name. 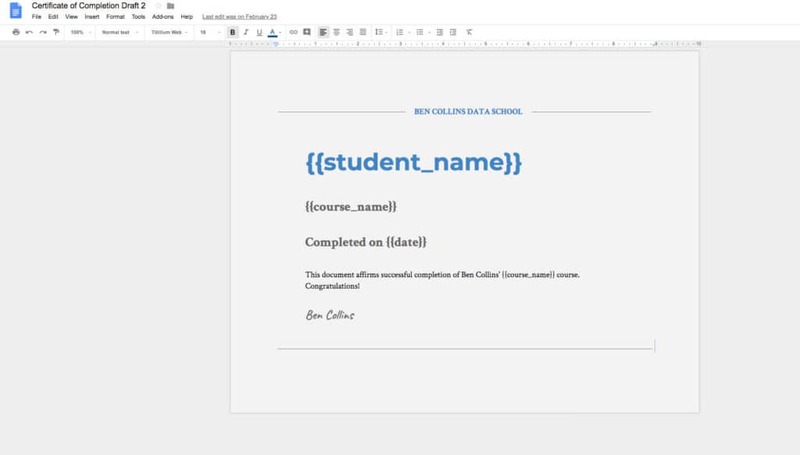 Then the script creates a copy of the certificate template, adds in the new student name, date and course name, and saves it as a PDF and emails it to the student via Gmail. Lastly, the copied template document is deleted so our Drive doesn’t get cluttered up with them all. The way we’re going to approach this is setup all the logic for creating and sending the certificates first, and then come back and connect Teachable at the end, following the basic example script above. Also, the final column stays blank. The script will auto-populate that with a date to show it’s completed the process of sending a certificate. Create a new Google Doc and set the orientation to landscape. These are placeholders for the student names, course names and completion dates that we’ll pass along automatically. Feel free to format the template to look pretty! Make a copy of the template URL, as we’ll need to add that to our script below. We have the Sheet with data ready to go and we have the certificate template, so it’s time to wire the whole shebang up. Change the TEMPLATE_URL to your own Google Doc template URL, by removing everything between the quotation marks (“…”) and inserting your the url you copied above between the quotation marks (on line 4). Change the certificate title to whatever you want (on line 5). In a nutshell, it retrieves any rows of pending certificates (ones that don’t have a date in the final column yet), formats the date nicely, creates the certificate, emails it to the student and deletes it from our Drive. You’ll notice that it calls on two other functions, createCertificate and emailCertificate, so we’d better create those. And finally, add the emailCertificate function, which handles sending this newly created file through Gmail. You’ll want to modify the message in here to your own copy. This is what’s shown in the email which the student will receive. We can now test it. Return to your Google Sheet and you should see a new custom menu. Boom! 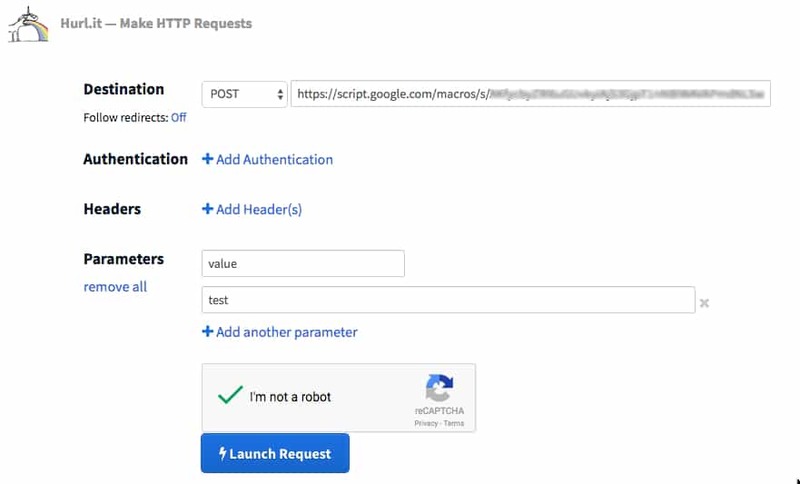 If everything goes to plan, you should receive an email (to the email address in your test data) with a PDF certificate, as shown in the following screenshots. You’ll also notice that the final column of your Sheet is now populated with a date to confirm a certificate has been issue and when. This is very similar to the basic example we started this article with. Copy the URL as we’ll need that for our Teachable webhook below. You can leave the “Send as a JSON Array” option unchecked, i.e. leave it as a grey X.
Hooray! That’s it, we’re set to go! When someone completes your courses, you’ll see data added to your Google Sheet. When you’re happy, you can then press Send Certificates from the custom menu and send them to students! You can set it back to Course Completion once you’ve ready. I actually prefer to leave my function set to manual, so I can open my Google Sheet, glance at all the new course completions, check there are no errors, and then, with a single click, run the code to send all the certificates out automatically. However, you can add a trigger to run this program once a day (or once an hour if you needed it more frequently) to completely automate the process. and in the popup click on “No triggers set up. Click here to add one now.”. And that’s it set for automating Teachable course certificates. 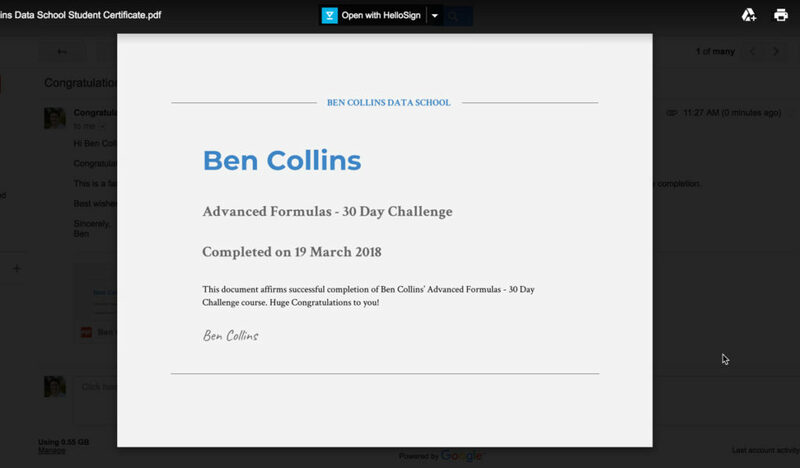 Once a day, your script will look to see if any new Teachable course completion data has arrived (remember, that bit is always automatic) and if there is any new data, it’ll just fire off the new certificates and add a date to show it’s completed. 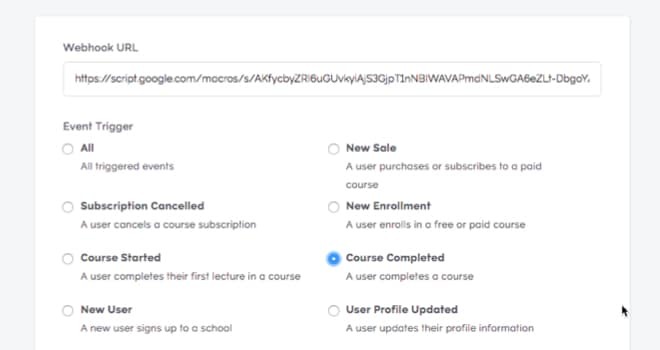 There are other webhooks like enrollments, transactions and lecture completions, which could be used to build other useful tools for the Teachable school owner. More to come in the future! very similar to this app, but need to display approved response on another web link that too with search option within that page.